The Hottest Jewellery Trends For Spring! For years now, I have had a bracelet (my dad gave me), a watch and a long necklace that my friend gave me which I wear with everything. This is the extent of my jewelry. 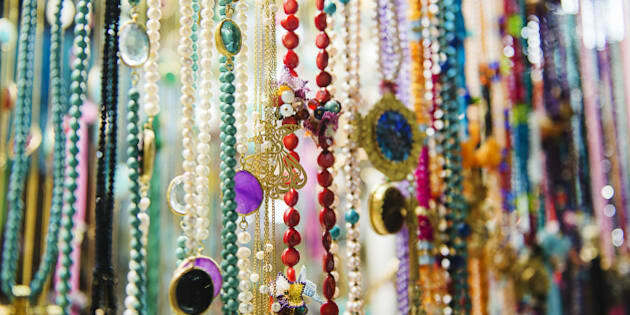 When I venture into downtown Vancouver, I always notice other women wearing layers of necklaces and looking so elegant. It looks simple, but how do I do this without over doing it? For years now, I have had a bracelet (my dad gave me), a watch and a long necklace that my friend gave me which I wear with everything. This is the extent of my jewelry. When I venture into downtown Vancouver, I always notice other women wearing layers of necklaces and looking so elegant. It looks simple, but how do I do this without over doing it? I was curious, so I spoke with Bianca Milov a jewelry designer. Bianca shared with me some of her top tips on how to use jewelry to spice up any outfit and how it can be done easily (I appreciate this!). What the hottest trends in jewelry this season? What are the hottest colours? And styles? Stacking necklaces, rings and even earrings. Gemstone necklaces such as crystal quartz, amethyst lapis and malachite. Shades of turquoise, marsala, and pinks are also trending this season. Top tips for updating and making a t-shirt and jeans outfit stylish with the help of jewelry? Stacking different length necklaces. Even adding in a lariat. With a simple outfit, you can really have fun with your jewelry and combine all different types of pieces. How to dress up an evening outfit? For evening, I think one bigger statement piece is perfect. A larger crystal quartz necklace, for example. What do you consider the key jewelry pieces for this season? For me, the key jewelry piece for any season is a simple necklace you can wear every day. To have a little more fun however, I love a lariat. They are so simple, but add a little something extra to your outfit. Warmer seasons are also a perfect time to play with nature motifs such as flowers and butterflies, which can be done with delicate pieces. Jewelry care is simple, the key is to remember to do it! Never sleep, shower or workout in your jewelry as these activities can cause tarnish. Remember to always clean your jewelry with a polishing cloth to solve any tarnishing problems. If a person is new to wearing jewelry to inspire an outfit, what are the top three tips? I always think that the simpler the better. If you're going to make a statement, make sure it's balanced. If your clothes have a lot going on, then delicate jewelry can balance that out and vice-versa. You don't have to spend a lot to look great, especially with jewelry. There are so many gorgeous pieces, from simple and delicate to statement that can work with any budget. Don't be afraid to mix metals! Just keep it to one or two types. Any other suggestions for women wanting to look great with their jewelry? Remember jewelry is personal, so wear what makes you feel good. With jewelry, you don't always have to follow the trend of the moment. Simple pieces can be trendy for a lifetime. I am going to use these helpful tips as I continue to expand by own personal style.